Imagine, if you can the grim thought that you haven’t packed enough books to read during your winter vacation. That happened to me last month. On the thirteen hour flight to Singapore I read all of Charles Cummings’ ‘Typhoon’ and on the connecting flight to Penang was quickly getting through ‘Hook’, the fourth book in the classic Bernie Samson masterpiece by Len Deighton. Once rid of the curse of jet lag I set about searching for a bookshop in downtown George Town. I found one which sold nothing other than local history which, although interesting, I was in the mood for some modern fiction and especially those by Asian authors whose titles may prove harder to find in the UK. On I wearily trudged in the stifling heat and humidity of a late Summer’s morning, stopping to pause for a drink of water a woman opened a shop door next to me and said hello. I replied and looked at the shop and to my amazement it was a modern looking bookshop! Once in I felt a sense of air-conditioned elation as I saw the rows of books in front of me. 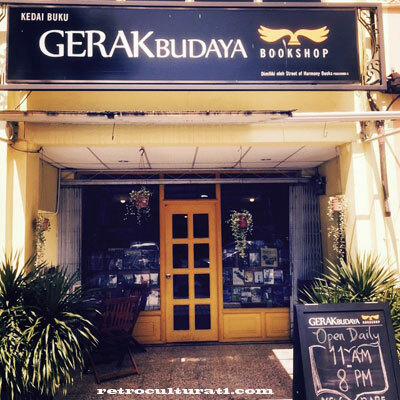 I had found Gerak Budaya Bookshop. The owner of the bookshop, Gareth Richards stopped to talk and, over a most welcome cup of jasmine tea told me of his desire to encourage more Malaysians to get into literature. A noble undertaking, Gareth also runs an editorial business and helps promote authors and cultural events in Penang. A former university lecturer, Gareth is passionate about books and his knowledge of his stock and the authors reminds one of how important a good, independent bookshop is to any community, anywhere. For me personally it was a great way to spend a couple of hours, I bought eight or nine books, mostly on South East Asia and look forward to reviewing some of them in due course. The bookshop is located on the famous ‘Street of Harmony’, a truly brilliant advert for multiculturalism and religious tolerance. If you are keen to visit the mosques and temples nearby then the bookshop is the perfect place to round of a cultural tour. The collection of English titles is huge and there are of course titles for Asian readers. The subject range is vast and Gareth’s staff are friendly and knowledgeable. For those of us who would love to visit more often then check out the website and see all of the new and upcoming releases in preparation for your next visit. You won’t be disappointed! Nothing beats a good bookshop, they’re also the very symbol of civilisation and culture, long may Mr Richards continue his good works . . . This is indeed my very best and favourable book shop ever or can I just quote ‘temporary heaven’ for me (?) before the eternal one. Completed my Pramoedya Ananta Toer and A. Samad Said masterpieces here. Thank you guys. Especially to Kakak (whom I did not know her name) and Gareth Richards whose stopping by and give a brief explanation about a book that I just bought, The Plaited Arts from the Borneo Rainforest.